Kaboost is the #1 rated booster in America that goes under the chair! Snaps on the chair in seconds and easily adjusts to fit 4-legged chairs (round, square or curvy legs). Because KABOOST easily holds up to 300 lbs., this unique chair riser provides many adults with needed extra height in their chairs. Little people, tall people, and adults with mobility challenges all use KABOOST to raise their chairs. KABOOST helps the senior population in addition to individuals with osteoporosis, knee pain, joint pain, arthritis, hip problems, and other health conditions. KABOOST allows adults to sit and stand on their own and provides them with independence and confidence as they don’t need to struggle or rely on others to get in and out of chairs. Adults can simply lean forward and gently rise without relying on another person for support or struggling to push off a side table or a chair’s arms. 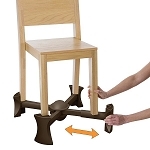 Helpful for people who have trouble sitting and standing from standard chairs.